The Samsung and the Pioneer units didn't reveal any visual artifacts when displaying the "Matrix" DVD movie. I was not able to find any glitches when the scenes were shown in full screen mode numerous times. The Toshiba had comparable image quality to the other 2 units, however when scanning during portions of the movie, it lagged behind due to the slower drive speed. It is interesting to point out that under most situations, we will not notice any performance difference when watching a DVD movie using a unit which is rated at 16x compared to a drive which was rated at 6x. It is only when you scan a sequence over a numerous times, that you might notice any advantage of a drive which is rated higher than a slower model. This is one of the factors which made me decide against upgrading my Toshiba unit for now, until there is an actual need for faster speed. During the portion of the CD Audio tests, the Pioneer unit had more of an advantage over the other 2 drives. It was faster and had lower seek times. This is good if you are using the DVD drive for CD Audio listening purposes, and if you tend to jump from one track to another a lot. There was no discernable differences in audio quality for all the units when comparing and listening to CD Audio tracks. If the speed of data transfer is important to you when you install programs and play games off the CD, the Samsung has the higher transfer rates and the lowest cpu utilization. It is a much faster drive than the Pioneer and the Toshiba whenever using data CDs. Samsung is an electronics giant from Korea who has steadily made inroads in the consumer electronics and PC market over the last few years. By offering up a good balance of performance, quality, and features, the SD-616 is able to compete in the same market segments which the product is geared for. There is a lot of upside to this DVD-ROM, and its a fairly impressive unit when compared to the Pioneer which is the drive that's considered to be the fastest on the market. 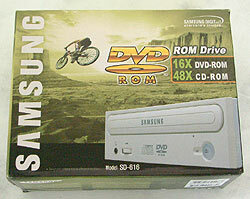 Overall the Samsung SD-616 is a unit that would make me consider upgrading my older Toshiba DVD drive, when considering the advantages of its faster CD-ROM capabilities along with its competitive DVD-ROM abilities. Its much more quiet, and better looking than the Pioneer drive as well.